In this day and age of coarse language and mannerisms, basic courtesy and manners make a person stand out in the crowd. Whenever a person shows the basic manners, gratitude and treats others with respect, it spreads positivity all around. People argue that today it is quite rare to come across such individuals. But, it is actually a matter of personal experience and surroundings. We cannot say that good manners and etiquettes have been wiped off the planet, nor we can say that everybody has the same level of it. Another thing to add is when we come across people of different cultures, and without knowing what they are actually trying to convey, we judge them. Though the basic mannerism remains the same for all of us, sometimes, specific actions or signs mean differently in other cultures. So, whenever you are in any such situation, be cautious before developing your perception about them. What people often fail to notice is that good manners leave a good impression on others. While someone may forget why they think well of you, it may be your courtesy or good manners that might have made an impression on them. Treat others as you want them to treat you. Put yourself in other people’s shoes and imagine how they would want to be treated. Be friendly, helpful, respectful, and courteous to the people around you. Just ask yourself, "If you were in their situation, how would you want to be treated?" 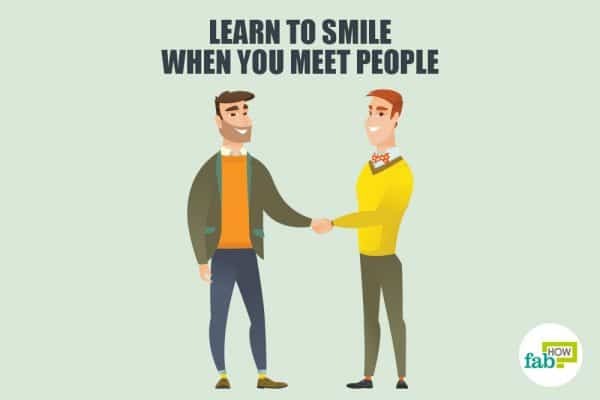 Learn to smile when you meet people. Acknowledge the presence of another person. Smile and greet people when you meet them. 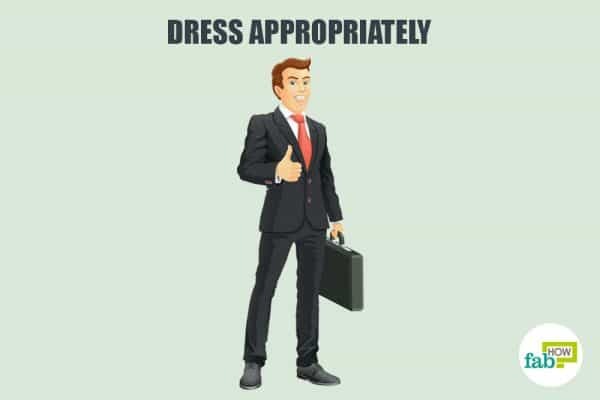 Dress appropriately. Every place or event has a dress code. Dress accordingly and look presentable. This includes taking a shower, keeping your hair, skin, nails, and clothing clean. Also, you should wear clean clothes. Your good manners may go unnoticed if you are not well-groomed. Introduce people the right way. The first step in making introductions is to know who should be introduced to whom. Introduce the higher ranking or older person first. If that doesn’t work, introduce the person you know better first. When in a business scenario or a party, the client's name should be taken first or the guest of honor should be introduced first. Other times, a man should be introduced to a woman. Phrases such as “I’d like to introduce you to” or “May I introduce you to,” should be used before taking the person’s name. Greet people when you are introduced to them. When you are introduced to someone, look into the person’s eyes, remember his name, and offer a handshake and say, “It’s a pleasure meeting you.” Make eye contact with the person you are talking to. 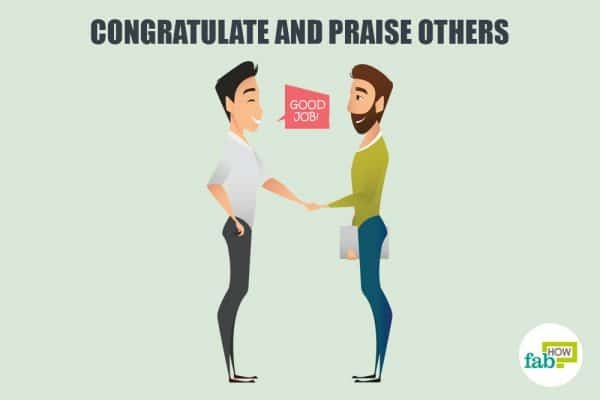 Congratulate and praise others. Congratulate people on their accomplishments or if they did something praiseworthy. People will more than likely remember you for acknowledging their efforts. Be a good sport. If someone wins you over a competition, race or sport, show good sportsmanship and congratulate them for their efforts. Acknowledge people when they leave. When someone is leaving your home, it is a good etiquette to walk them out to their car. Say a short goodbye like, “Drive safely. Thank you for dropping by. It was a pleasure meeting you. Give my love to your family.” Wave as they drive away. Leave once they have safely pulled out of your driveway. Say please and thank you. Every time you ask someone for a favor, remind yourself to say please. It does not matter how small the favor is. Every time someone helps you, say thank you even if it is to a barista serving you a coffee. Always make sure to say “excuse me” if you need to leave your dinner table or a social setting temporarily. Write thank you letters regularly. When someone gives you a gift, does a favor, or does something nice to you, send them a thank-you letter within a few days. Tell how thankful you are to them or how delighted you are to receive their gift. Although emails are better for people who live far away, a handwritten note is always better than a text message for the ones nearby. 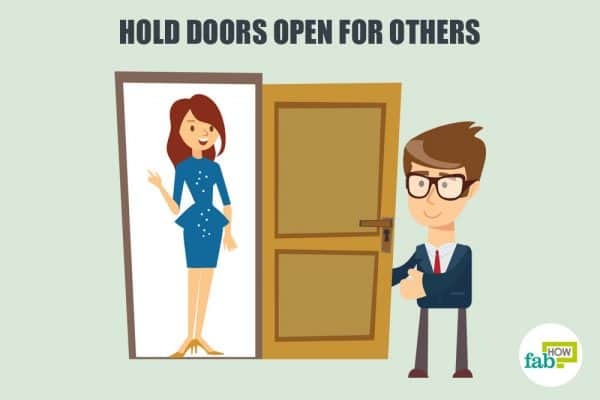 Hold doors open for others. Hold doors open for someone who would be entering shortly after you, for women, for someone with a baby stroller, for people with their hands full, someone with a child with them, people who are weak, elderly, handicapped, etc. 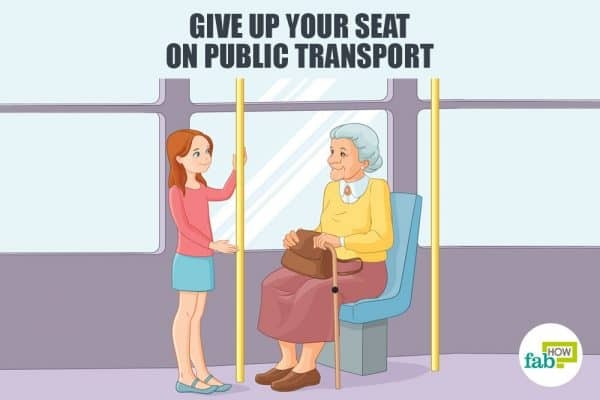 Give up your seat on public transport. If you are on a crowded bus or train, stand up, and offer your seat for the elderly, pregnant women, people with a lot of parcels, or people who are struggling to stand up. Speak politely. To develop good manners, practice talking in a lower volume unless the other person asks you to speak up. It should be low yet loud enough to allow people to hear you. Avoid shouting at the top of your lungs. Use your hands to emphasize your points. Use plain and simple language instead of fancy words that are difficult for others to understand. Try to speak in single speed and tone. Don’t interrupt people when they talk. Don’t interrupt or cut people off when they are speaking. Don’t get caught up in what you want to say that you stop listening and start sharing your thoughts. Practice good listening. Paying attention to people when they are talking reflects good mannerisms. Listen carefully when people are talking. Give them respect. Don’t let your eyes wander all over the place when someone is speaking. Don’t think about what to say when it’s your turn. Don’t get distracted in the middle of the conversation. Avoid talking only about yourself. When you are in a conversation, avoid focusing on yourself. Be curious about the other person’s life and ask questions. Try using “you” and “your” to keep the focus on the other person. Allow them to do the talking. When it is your turn to talk about yourself, keep it brief. Avoid asking personal questions. Avoid asking personal questions related to their finances, relationships, salary, weight, etc. Let people inform you about their personal lives when and if they wish to. Never talk about money. Refrain from asking questions like, “Wow, nice dress. How much does this cost you?” “How much does your house cost you?” “What is your commission?” “What is your salary?” “How much do you make from your business?” It is deemed to be too personal and maybe sometimes rude as well. The second person may or may not be interested in sharing this information with you. Use appropriate language. 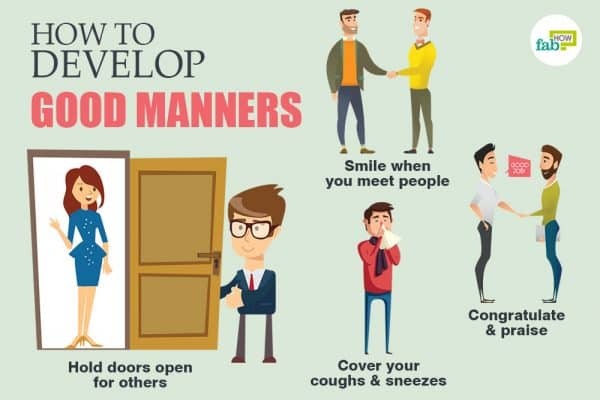 Be respectful of the gender, age, race, religion, political inclinations, and other factors to develop good manners. Avoid making inappropriate comments. Take a pause and think before opening your mouth. Avoid slang language, gossiping, sharing dirty jokes, or swearing in public. Be mindful of using cuss words in public. Avoid peppering your conversations with cheap witticisms or slang language that might offend people who are not interested in hearing such an unrefined choice of words. Avoid staring at people. Although looking someone in the eye while talking is considered to be good manners, staring at someone is rude. Blink and look away if you catch yourself staring at a stranger or making someone uncomfortable by staring. Avoid pointing fingers at people. Pointing with the index finger at something or someone is considered offensive. Avoid any kind of sarcasm and insult. When you feel like saying a sarcastic comment, "bite" your tongue until the urge diminishes. If you can’t say something nice, either don’t say anything or it may affect your relationship with the person. Avoid doing unpleasant things in public. If you want to comb your hair, apply lipstick, or tidy your dress; get up and use a restroom. It is very disrespectful to top pick your nose, spit, or scratch your private parts in public. Avoid invading personal space. No matter how close you are to someone, give them some personal space and privacy. Most people do not like having someone in their space all the time. Don’t touch. Avoid touching people such as patting them on their shoulder or touching their hair. Don't do it unless they specifically invite you to. Also, avoid touching other people’s things, children, or pets unless asked to. Don’t chew with your mouth open. This can make the people sitting next to you uncomfortable, as it isn’t a very pleasant sight. The chances are that half-eaten food might trickle out of your mouth if you are chewing and talking at the same time. Avoid making noise while you slurp, chew, crunch, or eat. Eating quieter tter and keeping your mouth closed are signs of good manners. Although you might be enjoying your food, smacking or crunching noises can be cringe-making for others. Do not talk with your mouth full. Most people find it rude and irritating when someone talks with their mouth full of food. Talk only once you swallow. Don’t rush. If someone is waiting for you to answer while you are eating, indicate with a gesture that you will talk once you have swallowed. Avoid putting your elbows on the table while eating. Putting your elbows on the table during a meal is unacceptable in most cultures. If the meal has not begun or over, it may be more acceptable to place your elbows on the table. Don’t take food off someone else’s plate. Never take food off someone else's plate in public, unless it is offered to you. Use your napkins to wipe your mouth not your nose. Table napkins should be used in the lap no matter if they are made of paper or cloth. Napkins can be used to wipe your mouth subtly, but stay away from using it to wipe off your lipstick or blow your nose. Cover your coughs and sneezes. Although this is something fundamental, yet not everybody remembers to cover their coughs and sneezes. 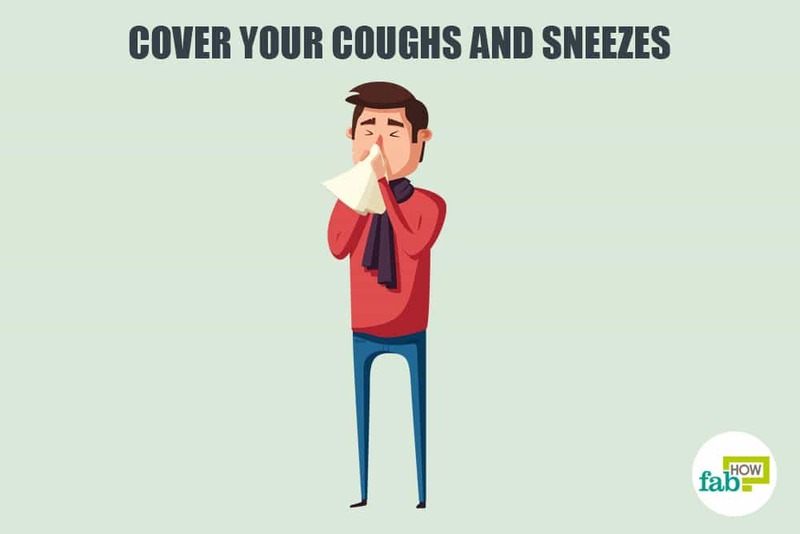 Always cover your nose or mouth with a tissue or a handkerchief when you sneeze or cough. If you don't have a tissue, cough or sneeze into your upper sleeve, not your hands. Avoid popping bubble gum in public. Blowing or popping a bubble gum in public is annoying for those around. Avoid blowing or chewing bubble gum in a meeting, church, job interviews, class, or when in a conversations, If you cannot chew gum without needing to open your mouth, avoid chewing a gum altogether in such situations. Do not drop trash on the ground. Dropping your garbage on the ground or in a public place can be considered rude and gives the impression that you lack respect for the community. Once you finish eating or drinking, throw the plastic cans, dishes, or containers in a garbage can. Do not leave it around and create a mess. Avoid drinking too much. When in social situations, avoid drinking too much. Most of the times, in an inebriated condition, you end up saying or doing things that you regret later. Hence, stop drinking before you start losing your control. Avoid cutting in line. Not waiting at the end of a queue for your turn and cutting in line is extremely rude. The next time you have this urge to cut in line, remember there are people in the queue who have been waiting longer than you. So, be respectful of others and wait for your turn. Only use your phone in appropriate settings. Avoid using your cell phone in the bathroom, in a meeting, on a dinner date, when with others in a social setting, and even on public transport. While talking on a phone in a public space, avoid being too loud or talking about personal issues in public. Avoid calling people after 9:00 pm unless it’s an emergency or it is arranged. Stay away from loud conversations over phone in public. It is irritating to have to listen to someone discussing their best friend's husband cheating on his wife or hearing about their ordeal with their mother-in-law, when you were planning to catch up on your book while in the waiting room at the dentist’s office. When you are in public, try to keep your phone conversations polite. If need be, cup your hand over your mouth while talking to avoid distracting others. Avoid profanity, complaints, or anything that is embarrassing for others. Save your intense conversations to a more private place. Practice basic courtesy. When someone answers your call, introduce yourself first and state what you want. Avoid being harsh. For instance: say, “Hello, this is Sam here. I would like to speak to Sally. Is she available?” If the person is unavailable, tell the person who answered whether you would call them back or request they call you back. When finished say thank you and goodbye. Wait for their goodbye too. Give people enough time to answer calls. Avoid hanging up after ringing just two or three times. At least give people time to hear the ring and answer them. Similarly, avoid letting the phone ring for too long. You might be interrupting as the person you are calling might be busy, sleeping, in a movie, etc. Prefer phone calls instead of texts. Texts are ideal for conveying short, instant messages, but remember that they are not always appropriate for important or sensitive information. Likewise, don't let the convenience of texting become an excuse for never arriving on time. Don’t waste people’s time by chatting for long. Avoid chatting for long hours to someone. Learn to respect others’ time. Answer the phone politely. Be pleasant and polite while answering the phone. If the phone call is for someone else, say, “Can you please be on the line, I will go and call him for you?” or if that person is unavailable, say, “I am sorry, he is not available right now. Can I take the message for him and ask him to call you back?” Before putting someone on hold excuse yourself and say, “I am sorry can you hold on a minute?” or “Can I call you back?” and wait for the person’s answer. Be polite online. Your online activity is a reflection of your offline personality. So, be respectful even in the virtual world. Stop posting nasty comments or disparaging comments on walls and status updates or avoid uploading unflattering pictures of your friends or tagging them in a group picture just because you happen to look good in it. Be mindful of bombarding people with minute-by-minute updates. Think about others when using social media. Drive courteously. Last but not the least, to develop good manners be a polite and respectful driver. Acknowledge drivers who let you out at a junction, let others in on a slow-moving traffic, give cyclists plenty of space, yield to pedestrians, use your turn signals even if there is no one around, and do not tailgate people. Note: The content has been edited and reviewed by Angela Webb, Licensed Psychologist. It’s interesting that you point out that dropping garbage in public is rude and shows a lack of civic sense. My sister wants to teach her kids to be polite and have good manners so that they can be more successful when they’re grown up. 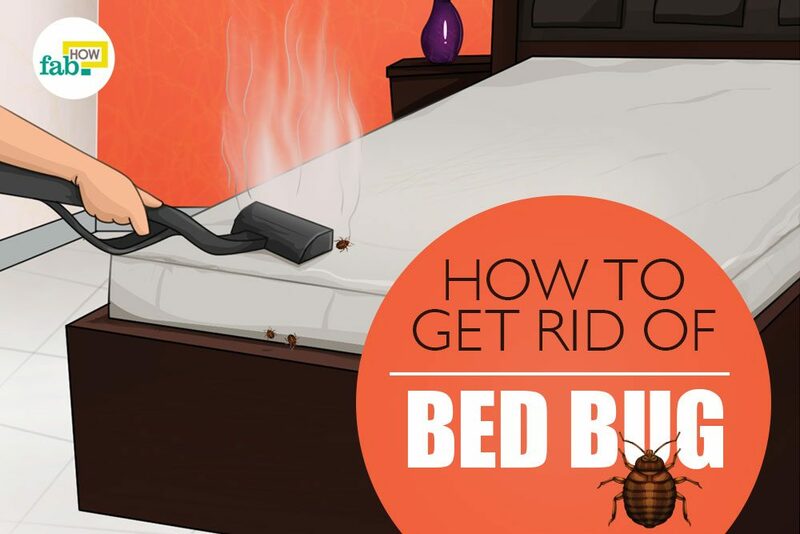 These tips will help her a lot. Maybe even talking to a professional would give her more good ideas.